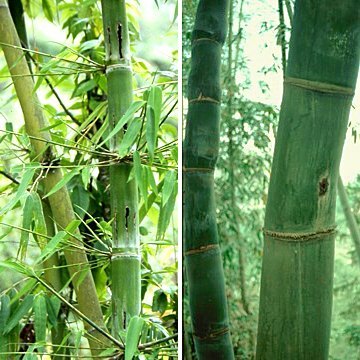 While there are currently no invertebrate pests or diseases that threaten to kill mature bamboos in western cultivation, a range of bamboo pests can damage or disfigure them to varying degrees. Some have been around for decades or more, but others have appeared more recently. Given the large number of such organisms that feed on bamboos in their natural environments, great care is needed to avoid importing pests. Quarantine procedures should be strictly adhered to, and those who introduce bamboos should make themselves aware of the potential insects, mites, viruses and fungae they might be importing, along with the serious economic and ecological consequences of accidentally introducing a new pest or disease into a country or region. Buyers of bamboo plants should be very cautious and inspect their new purchases extremely carefully. Visitors to bamboo nurseries and gardens should also be careful not to bring home more than they bargained for on their new plants or clothes, or in their hair. Bamboo Spider Mite, Stigmaeopsis sp. Shoot borer damage to culm in Nepal, 1983 (left). culm, in Yunnan, 1995 (right). There are a wide range of vertebrate animals that will feed on bamboo foliage or new shoots if available within reach, including gophers, squirrels, voles, raccoons, deer, rabbits, pandas, gorillas, livestock, elephants, and of course man himself. In addition there are also thousands of invertebrate arthropods that are actual or potential pests. These include many insects (Class Insecta, 6 legs: Orders Diptera, Hemiptera, and Lepidoptera), but also spider mites, usually with 8 legs, from Class Arachnida, which includes the real spiders. In their natural environments bamboos are components of a complex local ecology that includes many competing life forms, more or less in balance with each other. When plants are brought into cultivation elsewhere it is often the case that there will be some problems either for the introduced plants, or for the environment and ecological systems into which they are brought. Problems might arise because the introduced plants meet new enemies, eg bamboos encountering the grey squirrel in the US or England, or because old enemies are brought with them, without their own predators to keep them under control, eg the bamboo spider mite. The balance between predators and prey is altered by changing the constituents of any ecological system. The pests of bamboos in cultivation are best considered in this light, as ultimately a new balance must be reached. It may not be possible to eradicate pests altogether, and only time will tell whether pests can be eliminated, or native predators can adapt to make use of the new potential food source, or how the natural predators will fare if they are also brought in. It may be necessary to identify and understand the pests, their life cycles, and their ecology in their natural environments properly if they are to be controlled effectively, just as we need to identify and understand individual bamboos in order to make the most of them. Asian bamboos have literally thousands of invertebrate pests and diseases, see the ABS website for a comprehensive and frightening overview of all these by Mike Turner, and for further information on the more extensive range of bamboo pests found in the US. See the hefty Technical Reports from INBAR for more detail on Asian diseases and insect pests (2 big manuals, 12 downloads in total). It is important to realise that, with the notable exception of the 2-spotted spider mite, the most serious pests of bamboos described below are host-specific, i.e. only found on bamboos. These are not just a general infestation that has spread from other plants, although such pests as whitefly, other aphids eg bird cherry-oat aphid, and wheat curl mites can also build up. Growers and curators of collections should not be allowing them to proliferate, and everyone should be making strenuous efforts to avoid selling/exchanging plants with any pests on them. Bamboos regrow incredibly quickly from underground rhizomes, and the culms and leaves on which the pests are found only live for a few years anyway, so there is really no excuse for professional growers to sell plants harbouring serious pests. We can easily eliminate them in new commercial stock if we want to, and it is possible to get rid of them in smaller-scale existing plantings as well, if there is a serious will to do so. Visitors to infested bamboo collections should wash clothing and hair afterwards, and if your own plants are infested, please do the same before visiting other peoples’ collections. Bamboo leaves have a limited life span, longer for genera with thicker leaves, and will suffer various kinds of damage progressively over their natural life span of 2-5 years, without any pests or diseases being involved. Pest attack is most evident from attack of young leaves, which otherwise would be a healthy uniform colour, although environmental stress such as drought or cold can also damage young leaves. Bamboo Spider Mites of temperate bamboos are from a group formerly known as Schizotetranychus celarius (Banks, 1917), using a broad species concept, but which now constitutes 6 species or so in the genus Stigmaeopsis Banks instead (Saito 2004). They are by far the worst pest problem in bamboos introduced into the west, both in the US and now in Europe too. Stigmaeopsis nanjingensis (Ma & Yuan, 1980) may be the principal Bamboo Mite species of bamboos in western cultivation (Pellizari & Duso 2009), and it is the most serious pest in temperate bamboos in Asia. 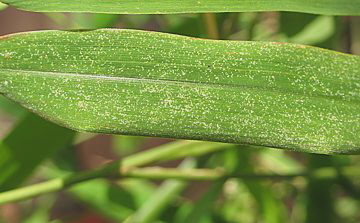 These mites make nests under thick webbing tents, mostly along the edges or midrib of the underside of the leaf, and the damage is thus localised in many small rounded white patches, which can make bamboo leaves look very unattractive. They can spread easily on their own by crawling, and are helped by birds, squirrel tails, human hands, etc., so they should be dealt with promptly or they will spread from clump to clump quite rapidly. Predators that can keep them under control in Asia, such as the mite Typhlodromus bambusae Ehara, 1964 have not yet been introduced to the US or Europe, where native and/or commercially available predatory mites do not seem to be effective. Either the silken nests are too tough, or they are too well defended. Currently the only guaranteed treatment is the removal of all above ground growth, which should be burnt, in a slash and burn or ‘scorched earth’ procedure. Regrowth from the rhizomes should be monitored, and any reoccurrence given the same treatment again. Alternatively, repeated and thorough spraying of absolutely all the leaves on a regular basis for several months or years with horticultural strength insecticides/miticides, wetting agents and soaps can eventually eliminate them, in theory at least. Avoiding bamboo spider mites in the first place is obviously by far the best solution. However, in the US and mainland Europe many, if not most bamboo collections and nurseries are now infested heavily or sporadically with these mites. Visitors and buyers should beware. Efforts to keep these out of the UK since they first came to our attention in the UK (Stapleton 1996, Ostoja-Starzewski 2000) were partly successful in stopping the spread for many years, but the mites are now well established in several UK bamboo gardens, so visitors beware. It is very easy for these tiny insects to be picked up or deposited accidentally by brushing clothing or hair on bamboo foliage. New plants should be monitored particularly closely and cut back to the ground if mite colonies are seen or suspected. Older plants should get a regular routine inspection or sanitary clear-felling as well. Other spider mites such as the ubiquitous 2-spotted greenhouse mite, Tetranychus urticae Koch, 1836, commonly found on many houseplants, are not often a problem outside except in the driest of climates, but they can build up quickly indoors under hot dry conditions, leading to speckled leaves that fall off early, associated with a light but extensive webbing all over the plant. Insecticide sprays are often adequate for control. Indoor bamboos also benefit from regular water spraying, and periodic, temporary relocation outside in wet weather (not in the winter, especially for tender species). Predator mites can be useful for control of these mites on long-term plantings under glass or indoors. Eriophyoid mites are strange-looking, extremely small, conical mites with only 4, short, apical legs, rather than the 8 legs of the spider mites. To the naked eye they are only tiny black or grey spots, and even under a hand lens the white ones are nearly invisible. The mites look like tiny white conical maggots or dark eggs. Even with a x10 hand lens it is hard to see that they are mites, because of their small size and because their legs are grouped near the head so the effect is rather squid-like. These have received very little attention because they are so small, and rarely noticed. Two bamboo species, apparently from genera Jaranasia Chandrapatya & Boczek, 2000, and (possibly) Aceria, Keifer 1944, have been seen in the UK. Their identification is still uncertain. These two species do not produce galls in bamboo leaves, as better-known species do on trees and shrubs, nor do they roll the leaves for protection, like the Wheat Curl Mite on cereals, see below. Instead they cause yellow, red and brown patches when dense colonies build up, and the leaves eventually die. It would appear that in the UK at least, most only become troublesome in dry conditions when bamboos are cultivated indoors or under glass, and they can usually be controlled by maintaining higher humidity levels and/or spraying with insecticides. Outdoors the purple, or ribbed tea mite Calacarus carinatus (Green 1890) Keifer, 1955 has established colonies on my Fargesia murielae, but it is not currently causing significant damage. Unlike other mites, it apparently thrives in damp conditions, even monsoon rain, maybe because of its prominent waxy longitudinal ridges. Starting off white, the mites turn purple later, and they are a serious pest on all Camellias, but economically most significant in tea plantations. Thinner-leaved bamboo species would appear to be more prone to eriophyoid mites building up to damaging levels under glass, notably Thamnocalamus, Drepanostachyum, Himalayacalamus and Borinda. Bamboo aphids outdoors in the UK are all from the genus Takecallis Matsumura, 1917, (Order Hemiptera; Suborder Sternorrhyncha; Family Aphididae; Subfamily Myzocallidinae), falling under the general garden term of greenfly. Outside they do not cause extensive direct leaf damage. However, the honeydew they excrete onto the leaves is sticky and leads to growth of unsightly black fungus, which can cover entire leaves. The problem may be seasonal or localised, often exacerbated by a mild winter. Severe infestations can lead to leaf drop, even killing young plants indoors or under glass. Damage by aphids can also occur through the spreading of viruses, which can cause yellowing of leaves and defoliation, e.g. Barley Yellow Dwarf Virus (BYDV) spread notably by the Bird Cherry-Oat Aphid, Rhopalosiphum padi (L.), but also I suspect by bamboo aphids as well. Natural predators such as ladybird beetles and their larvae abound. Native ones are not fussy about the origin of their prey, and the introduction of the non-native Harlequin Ladybird is also helping to keep aphid numbers down. The bamboo-feeding aphid species also seem susceptible to a variety of pesticides, as well as the usual aphid deterrents and treatments, such as chilli pepper spray, and soap. Four aphid species are now common in Europe, all introduced from Asia. Takecallis arundinariae (Essig, 1917) is a pale translucent aphid with pretty winged forms with 2 rows of dashes. T. arundicolens (Clarke, 1903) has wingless forms identical to those of T. arundinariae, but the winged forms do not have rows of spots, having tiny but distinct spherical black ‘tails’ instead. Takecallis taiwanus (Takahashi, 1926) is much greener, the winged forms lacking easily distinguishable characters, but the wingless forms having 4 prominent rows of dorsal bristles. New for 2015 in the UK is a fourth species, which spreads very fast, slightly smaller than the others, yellow rather than white or green, the winged forms having no dashes or black tail, but all-black antennae. This species seems to key out using the key in Qiao & Zhang (2004) as T. takehashii (Hsu, 1980), a little-known species from Taiwan, but the identification has not yet been confirmed by an entomologist. Bird Cherry-Oat Aphid, Rhopalosiphum padi (L.) is a small green aphid, the marbled-green wingless forms having a red rump, and the winged forms having a large, dark thorax and prominent siphunculi, the 2 tubes from which honeydew is exuded. It is common on nursery stock, spreading BYDV, which is very evident here on yellow leaves of Borinda papyrifera, as supplied online from a UK nursery. Several different leaf-rolling pests are a very serious problem in Asia, and some are reported in the US, but they are not yet found in Europe. 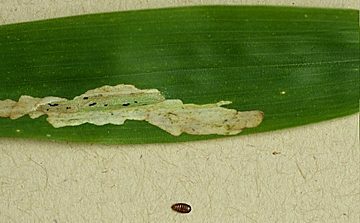 However, the wheat curl mite Aceria tosichella Keifer, which can lead to most leaves on a bamboo remaining loosely and irregularly rolled in an untidy manner has been seen on nursery stock, and it is now impossible to control. Several other insects that usually live on other plants may roll the occasional bamboo leaf as well, e.g. leaf-rolling spiders and froghoppers (Cuckoo Spit). Leaf miners (Order Diptera; Family Agromyzidae) are the next category of pest that have been imported from Asia to Europe, and plants should be checked for translucent areas in which the small larvae have been feeding within the leaf. The miner, which has been identified as Cerodontha unisetiorbita Slobin, 1993, has now been introduced to Italy, Switzerland, Czech Republic and Germany. 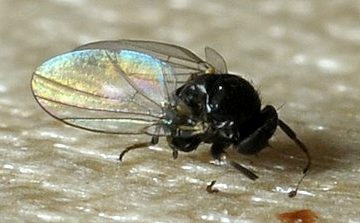 It is a very small black fly that is unlikely to be seen, with pale larvae that cause the damage, and red-brown pupae. 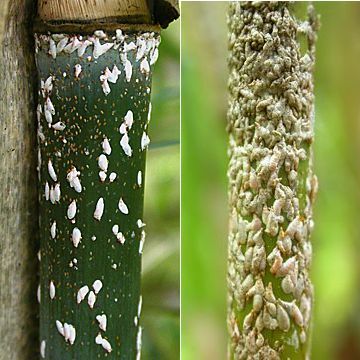 Various insects can live on the surface or in the hollow interior of bamboo culms, but the main pests of western bamboos live on the surface and are from Order Hemiptera; Suborder Sternorrhyncha. They are woolly aphids (Superfamily Aphidoideae; Family Aphididae; Subfamily Eriosomatinae), and various scale insects from Superfamily Coccoidea. Armoured scale insects are from Family Diaspididae, soft scale insects are from Family Asterolecaniidae and mealybugs, the unarmoured, i.e. scale-less, scale insects are from Family Pseudococcidae. Woolly aphids, such as Pseudoregma bambucicola (Takahashi, 1921) (syn. Pseudoregma bambusicola Szelegiewicz, 1968), originate on bamboos in tropical and subtropical areas, and are only likely to occur on bamboo collections under glass in Europe. Unlike other aphids, they cover and feed on new shoots and branches rather than leaves, while producing the same messy sugary exudations in a similar fashion. Scale insects come in different shapes and forms, from soft, walking mealybugs to resilient relatives fixed under armoured shields. Incidence in European bamboos has just been reviewed (Ülgentürk et al. 2014). Armoured scale insects have recently become much more prevalent in bamboos in Europe, although some have apparently been present for a long time. Most notable is Bamboo Scale, Kuwanaspis pseudoleucaspis (Kuwana, 1923). The females crawl up to a new permanent location under a small orange scale in the summer, then grow under old moulted scales and a white waxy extension, together forming an oyster-shaped covering, under which they overwinter. Their favourite location is under culm sheaths and branch sheaths, but they are also found on leaf petioles and under leaf bases in autumn when they have become well established in a clump. As is the case with armoured scales on other plants, they are difficult to eradicate completely from bamboos without total destruction of all above-ground growth. The insect body is soft and vulnerable, but the mature female lives under hard scales and the waxy extension, protected from predators, weather and chemical treatment. Hard frost and dampness seems to kill most exposed adults, but when a tough, persistent bamboo culm sheath or a dense branch cluster is added to the equation, eliminating this customer is not an easy task. Annual removal of persistent culm sheaths, especially those near the base of the culm, along with regular removal of the older, more branched, culms on which they tend to accumulate, can at least keep it under control and may eliminate it eventually. Spraying with insecticide in early summer, when the apparently more vulnerable young crawlers emerge from their waxy shelter, is supposedly effective to some degree, but the timing must be precise. Other Asian diaspids, including 3 Odonaspis species are found in southern Europe, Turkey seeming to be a main entry point. O. greeni (Cockerell, 1902) is illustrated in Soria et al. 1998. Soft scale insects, also known as pit scales because they cause small depressions on some plants (not bamboos), are similar to armoured scales but inhabit a softer, rounder scale, the test. They have a shorter life and are pests of subtropical areas and collections under glass, eg Bambusaspis bambusae (Boisduval, 1869) on Bambusa in the Eden Project, Cornwall. Mealybugs, unarmoured scale insects, are similar to woolly aphids in their waxiness, but do not have the pear-shaped bodies or obvious long legs of aphids, nor the scale of the armoured and pit scale insects. Although unlikely to seriously affect the growth of bamboos in cooler climates, they are unsightly and spread fast. Like the woolly aphids, they can form dense colonies and also exude sticky sap, but they feed mainly on young branch shoots under the culm sheaths. Balanococcus kwoni Pellizzari & Danzig, 2007 is now commonly encountered on nursery stock in much of Europe. The giant bamboo mealybug Chaetococcus bambusae (Maskell, 1893) is probably only going to be a pest of bamboo collections under glass, eg on Bambusa in the Eden Project in Cornwall. Natural control from native predators including ladybird beetles can apparently keep numbers down, and mealybugs are from warm climates and may be checked somewhat by cold weather. Removal of culm sheaths, branch clusters and older culms should help to reduce numbers, especially out of doors. They are susceptible to chemical treatments, but their waxiness and their habit of hiding under sheaths gives them good protection. Even systemic treatments may not be completely effective. They can survive in the soil and may even feed on the roots and rhizome shoots. Prevention is always better than cure. Check new plants, keep them isolated, and destroy infested plants completely as soon as possible. Inhabitants of the bamboo culm and cavity include shoot borers, which eat into soft new shoots. They can cause substantial, unsightly damage, and lead to death or disfiguration of many new shoots in Nepal and probably other Asian countries. In Europe & the US native borers adapted to similar plants such as maize have attacked bamboos. Fortunately no shoot borers specific to bamboos have been introduced so far, although this could happen easily as the larvae come from an unexpected group of insects, the moths (Order Lepidoptera), which can overwinter in large numbers as pupae hidden inside the culm, or in soil or leaf litter as a hard individual chrysalis. 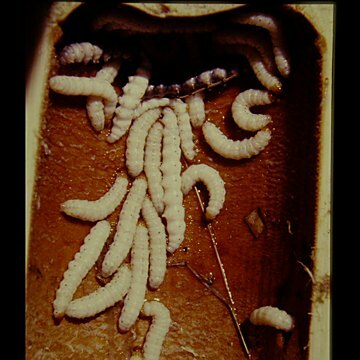 In addition, bamboo shoot borer larvae are often highly prized as a culinary delicacy in Asia, and will probably be introduced deliberately into cultivated bamboos in warmer countries. When I described the pattern of damage, the unusual life cycle overwintering inside the culm, and potential control measures for shoot-boring moth larvae in Nepal (Stapleton 1985, 1987), there was a certain amount of eyebrow-raising from local entomologists at the time, as conventional wisdom in S Asia was that this damage was caused by the bamboo hispine beetle Estigmena chinensis and Cyrtoctrachelus weevils instead. Noctuid moths were known to cause damage in China, but they are rather different, overwintering in the soil, making control difficult. Samples of moths I considered responsible for the damage in Nepal were identified by the Natural History Museum (London) in 1985 as a noctuid moth from the genus Pareuplexia. A pyralid moth, Epiparbattia gloriosalis Caradja, was later reported as having a similar life cycle in culms of Sinocalamus latiflorus in S China, in the review of bamboo insect pests of Asia by Wang et al. (1998). A crambid moth, Omphisa fuscidentalis Hampson was also later identified as overwintering in bamboo culms in Thailand, Laos, Burma & Yunnan (Singitrop et al., 1999), in much the same way as the moth from Nepal, but was reported as not damaging the culms, if anything making them stronger. The larvae of this species are the economically important edible variety, now known as ‘bamboo worms’. The pattern of damage I reported in Nepal with slits in the culm in 1985 does indeed look different to swollen but intact culms I saw in S Yunnan in 1995, see photos above. Further work is still required to identify and study the life cycles and damage caused by these pests. Many thanks to Drs Daniel Pye and Chris Malumphy, entomologists at the UK Food and Environment Research Agency (Fera), for authoritative identification of the mites and the scale & aphids respectively, and for information on occurrences in the UK. Higuchi, M. (1968). A revision of the genus Takecallis Matsumura (Homoptera: Aphididae). Insecta Matsumurana 31(4): 25-33. Ostoja-Starzewski, J. (2000). Schizotetranychus celarius (Banks) (Acari: Prostigmata) a mite pest of bamboo; first records for Britain and two new host records. British Journal of Entomology & Natural History 13: 95-97. Qiao, G.X. & Zhang, G.X. (2004). Review of the genus Takecallis Matsumura (Homoptera: Aphididae: Myzocallidinae) from China and description of one new species. The Raffles Bulletin of Zoology 52(2): 373-378. Ülgentürk, S., Porcelli, F., & Pellizzari, G. (2014). The Scale Insects (Hemiptera: Coccoidea) on Bamboos in the Western-Palearctic Region: New Records and Distributional Data. Acta zool. bulg., Suppl. 6, 2014: 77-82. Saito, Y., Mori, K., Sakagami, T., & Lin, J. (2004). Reinstatement of the genus Stigmaeopsis Banks, with descriptions of two new species (Acari, Tetranychidae). Annals of the Entomological Society of America 97(4): 635-646. Stapleton, C.M.A. (1985). Noctuid shoot borers in Dendrocalamus and Bambusa species. Nepal Forestry Tech. Info. Bull. 11: 26-31. Stapleton, C.M.A. (1987). Bamboos. In: J. K. Jackson, Manual of Afforestation in Nepal: 199–214. Forestry Research Project, Kathmandu. Tippawan Singtripop, Somsak Wanichacheewa, Seiji Tsuzuki, & Sho Sakurai (1999). Larval Growth and Diapause in a Tropical Moth, Omphisa fuscidentalis Hampson. Zoological Science 16: 725–733. Wang, H.J., Varma, R.V., & Xu, T.S. (1998). Insect Pests of Bamboos in Asia: An Illustrated Manual. INBAR Technical Report No. 13. INBAR, New Delhi. Xue, X.F., Song, Z.W., Amrine, J.W., & Hong, X.Y. (2006). Eriophyid Mites (Acari: Eriophyoidea) on Bamboo from China, with Descriptions of Three New Species from the Qinling Mountains. Annals of the Entomological Society of America 99.6 (2006): 1057-1063.